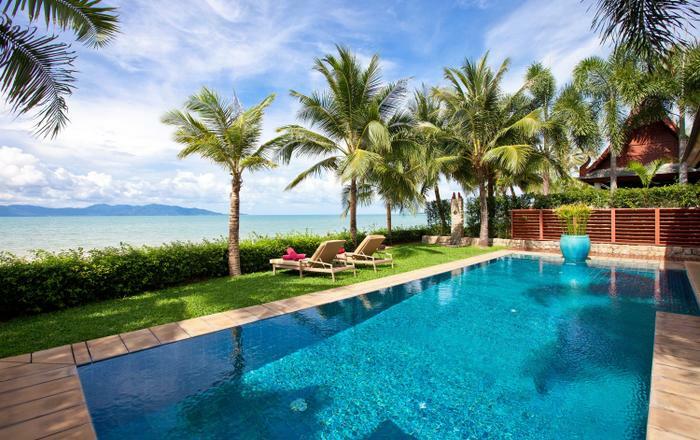 Only half an hour away from Koh Samui Airport, Villa Malouna lies on the tranquil Laem Noi Beach along the northern shore of the island. 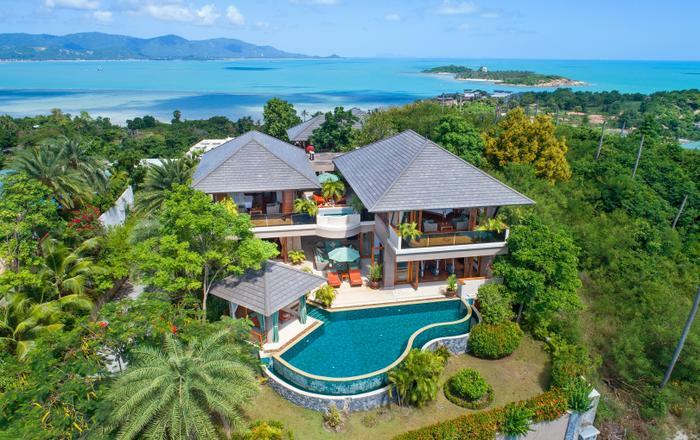 Forty-five meters of pristine beach frontage, opulent vegetation and views across to the neighbouring island of Koh Phangan - offers Villa Malouna an exceptional setting. A short swim or kayak from the beach, lies a colourful coral reef, perfect for snorkelling. At dawn, you can watch the local fishermen quietly lay their nets for the day’s catch. The sunsets along this beach are exquisite, and the villa offers perfect viewpoints while relaxing in the infinity pool, or sipping cocktails. Immediately after passing through Villa Malouna’s oversized wooden doors into it's secluded tropical garden filled with frangipanis and paradise bird flowers, you are enveloped in serenity. The architecture of Villa Malouna has been conceived in synergy with the island’s natural surroundings, lush vegetation and lagoon views. 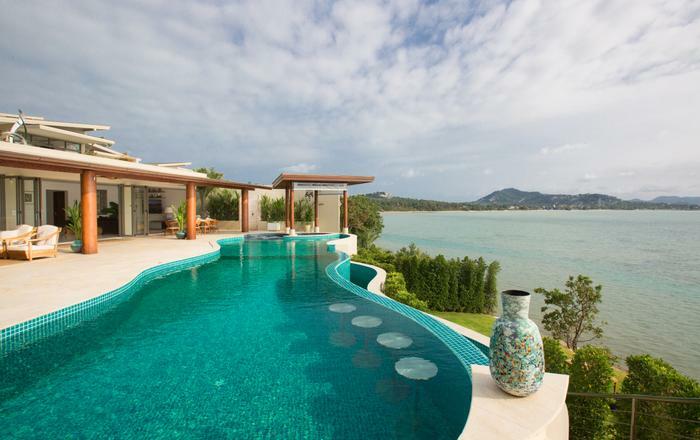 Inspired by Japanese Zen style and mid-century modern architecture, the villa is modern yet indigenous, gracious and understated. Its open-plan is designed to let the outdoors in to make the most of the island’s breath-taking views, light and climate. The architecture is complemented by stylish interior design furnished with carefully selected natural materials that strike a perfect balance of warmth and coolness, with honey coloured teak wood to cool white and black terrazzo. 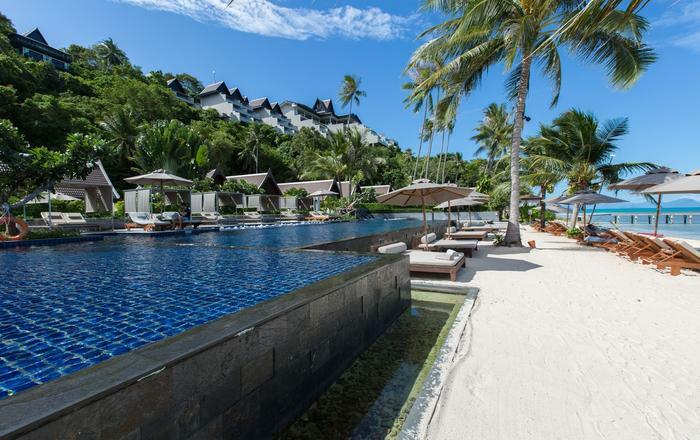 At the heart of the villa, a twenty-seven meter infinity pool adorned by emerald green Sukabumi stones, opens up to panoramic views of white sand beach and lagoon. Perfect for laps or relaxing dips in the refreshing water, the pool also has a shallow area for small children to enjoy a splash. A wide wooden deck, made of specially-treated sustainable wood flown in from the Netherlands, is equipped with welcoming silver grey beanbags and offers guests a voluptuous setting for reading or taking a nap. Of course, there is always the option of enjoying a drink under a parasol on the powdery sand beach just a footstep away from the pool area. The sunken pool lounge is the perfect place for an evening cocktail, while enjoying sunset views and a cooling breeze from the beach. Villa Malouna’s flexible layout means that large parties can spend time together, but guests can also escape to the calmness of the serene bedrooms and tropical garden. Two seaside pavilions house the communal spaces – one the living space, and the other, the dining space with an open kitchen both feature ample folding windows which completely open up to the gorgeous island surroundings. The gentle sea breeze and ceiling fans ease the island’s heat and white terrazzo floors throughout the villa are cool under foot. The living rooms’ main feature is the impressive floor-to-ceiling teak library that houses a selection of beach side reading books as well as the fully equipped media system. A bespoke L-shaped solid wood sofa, made to order by local craftsmen allows you to sprawl out with the breath-taking views over the infinity pool, garden and lagoon. A fully-integrated sound system pipes music throughout the communal area. A few steps from the living pavilion is the dramatic black dining and kitchen pavilion. A stunning black open kitchen features Tom Dixon copper lighting, a solid wood dining table an striking piece of artwork on the wall, each of which makes a distinctive statement. The black kitchen is used for breakfasts and serving, and can host a private cooking class by Villa Malouna’s in-house chef, while another service kitchen lies in the staff area to prepare more elaborated dishes. With the in-house chef, an exclusive culinary experience can be designed upon a guest’s wish; improvised picnics on the beach, a romantic dinner or a casual beach barbecue at sunset with local produce. Six en-suite bedrooms are nestled in three separate bedroom pavilions. A pool side pavilion that faces the magnificent views of infinity pool and lagoon, houses two bedrooms; one with a king size bed and the other with twin beds with an extra pull-out bed, ideal for parents sharing the room with a young child. Each room has a modern and spacious black terrazzo bathroom with rain shower that opens up to its own private back garden. In the king size bedroom, the bathroom boasts a beautiful stand-alone white terrazzo bathtub. A garden pavilion with a further two bedrooms offers calming views of the tropical gardens. Same as the poolside quarter, each bathroom comes with a private back garden. And the last two bedrooms which lie above the kids’ bunkroom, are perhaps the most private ones and offer fantastic panoramic ocean views from their elevated positions. All bedrooms are designed to be minimalistic to create a serene and relaxing atmosphere, ideal for resting. Bespoke live-edge wooden bed and crisp, white linen makes a strong design statement while bringing warmth to the room. Every little one’s dream escape, Villa Malouna has a specially designed large kid’s dormitory with built-in bunk beds that can house up to eight children. It has a spacious play area with floor to ceiling black chalkboard for kids to express their creativity, a swing and two swing chairs to stay active, and shelves stuffed with toys and books to keep them entertained. The room is tucked behind the dining room, away from the pool to provide extra safety for young ones. Although Villa Malouna is the ideal place to relax and unwind, there are also plenty of options to stay active. 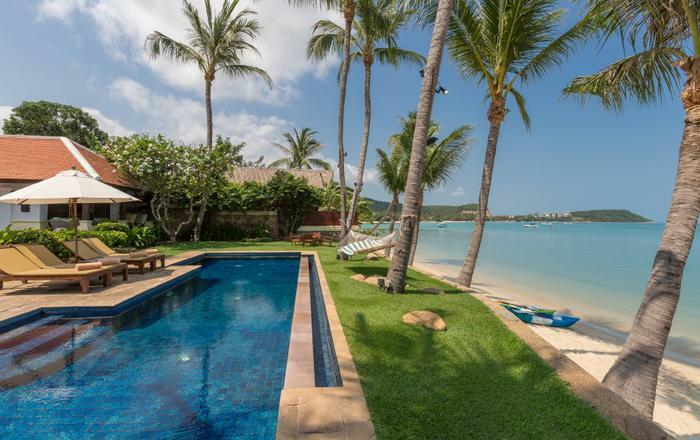 Explore the bay with the villa’s Kayaks and Paddleboards, and why not pay a visit to the nearby beach of the Four Season’s Resort that neighbours the villa from the lagoon. 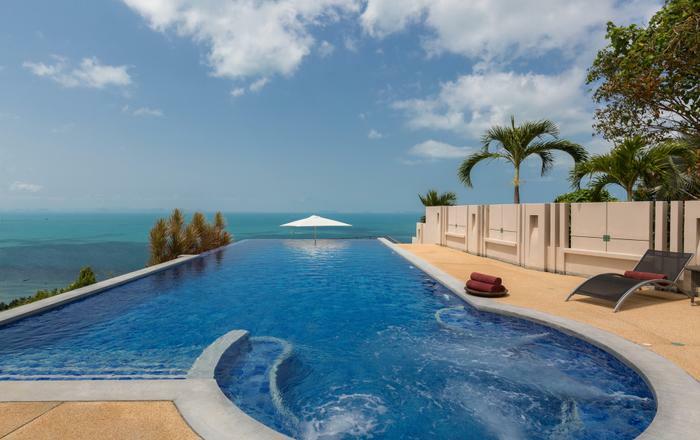 The twenty-seven meter infinity pool is great for fun water games as well as doing some serious laps. A morning run or sunset stroll along the pristine white powder sand beach is a perfect activity for all. 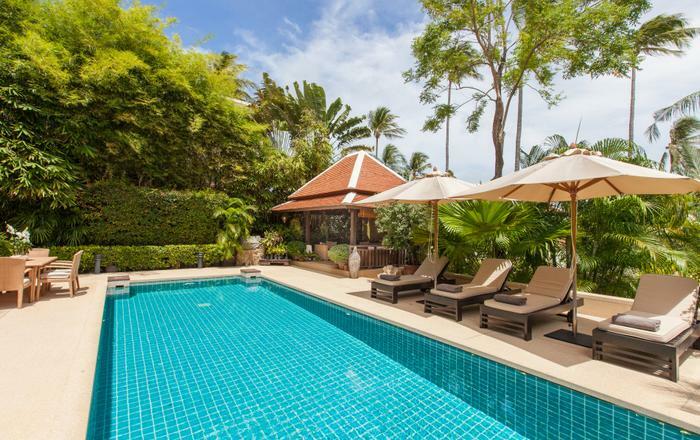 The pool deck or lawns make the ideal place to practice yoga, high intensity workout or Thai kick boxing, all of which can be accommodated by the villa with a private teacher, upon request. Upon arrival, the villa’s four dedicated staff welcome the guests. These four experienced staff; the villa manager, the in-house chef, the housekeeper and the handyman, team up to provide tailor-made services with attention to detail. 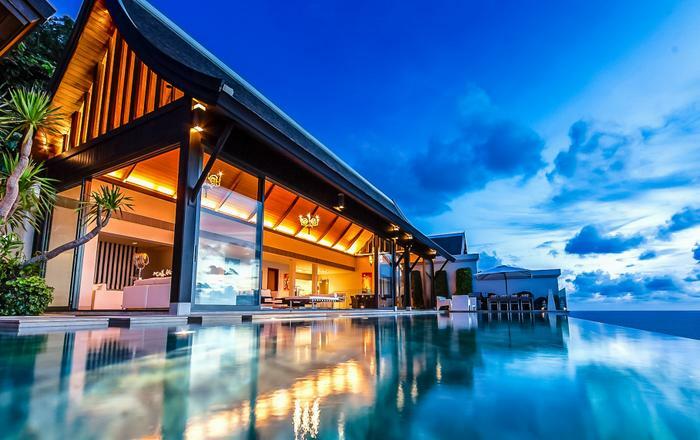 Make any request to the villa manager such as candle lit dinner on the beachfront, an early morning private yoga session on the pool deck, or full day excursion to the neighbouring islands, Koh Phangan or Koh Tao or an uninhabited island in the Angthong National Marine Park. 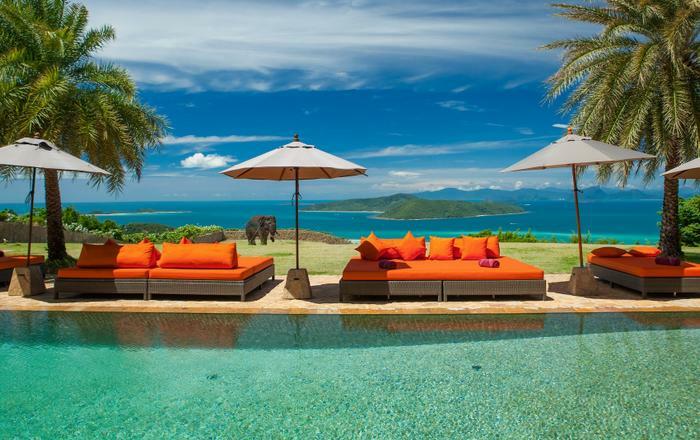 Based on the intimate knowledge of the villa surroundings and the island, she will compose a unique experience that will ensure each and every guest return home with fond memories. A perfect beachfront oasis with luxury services, tailor-made activities, and gracious modern architecture, Villa Malouna warmly invites you to an unforgettable vacation.